Rulon® plastics are a family of reinforced PTFE resins manufactured by Saint-Gobain Performance Plastics. Rulon® offers high compressive strength, a low coefficient of friction, and high abrasion and corrosion resistance. Upland Fab are experts in Rulon® machining, and can produce high precision parts and components that match your unique specifications. In addition to the characteristics listed above, Rulon® plastics offer an extremely broad operating temperature range (-400° to 500°F/-240° to 260°C) and a unique no slip-stick property that prevents erratic motion in low speed applications. With its low coefficient of friction, Rulon® provides outstanding performance without lubrication. The most common uses for Rulon® include extremely high temperature seals, piston rings, and bearings, as well as plastic electrical insulation applications. There are many grades of Rulon® plastics available, including Rulon® LR, Rulon® J, Rulon® 641, Rulon® AR, Rulon® 142, Rulon® 123, and others. Each Rulon® grade offers distinct performance characteristics that may make it better suited to your application than other grades. Contact Upland Fab to discuss your material requirements. Upland Fab utilizes advanced multi-axis machining capabilities to produce high precision Rulon® parts, with tight tolerances and perfect repeatability from one piece to the next, no matter how high the quantity. Our CNC machining technology minimizes the time required for handling and fixturing; in many cases, even extremely complex parts can be completed in a single operation, for faster and more efficient production. We use DPD/MBD processes (Digital Product Definition/Model-Based Definition) that allow us to work directly from your CAD models or digital design files. Working straight from your designs helps us eliminate manufacturing errors and enhances precision. This results in better quality parts at lower cost. Because we know the importance of good communication, when you work with Upland Fab, you’ll have a single point of contact throughout your entire project. We’ll provide reliable, timely updates to keep you informed every step of the way. No one provides better or more efficient Rulon® machining than Upland Fab. Request a quote to get started on your project, or contact us to find out more. 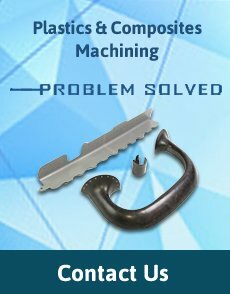 We have been providing top-flight plastic and composite machining in Southern California since 1970. Contact us for more information or request a quote on Rulon® machining for your next project.